IN the midst of the 800th anniversary of Sodbury Market last year, it will have escaped the attention of most people that Yate too, was marking an 800th anniversary of a market. The 13th century was the heyday of setting up planned market towns. In 1218, Henry III granted Ralph de Willington, lord of the manor of Yate, the right to have a market. Unfortunately, evidence of what actually occurred is scant and historians have determined the market idea was abandoned in the later 13thcentury. Another market close by prevailed and the rest, as they say, is history. When older residents of Yate think of Yate market they will think of a fortnightly event where livestock and produce was sold. The market enjoyed its heyday in the later 19th century and rallied at certain points during the 20thcentury, but was largely in decline after the Second World War. The final closure in the late 1970s appears to have generated barely a whimper. Yet, for many in the farming community and what was a far more rural area around Yate, the market by Yate railway station was an important part of their economic and social lives. 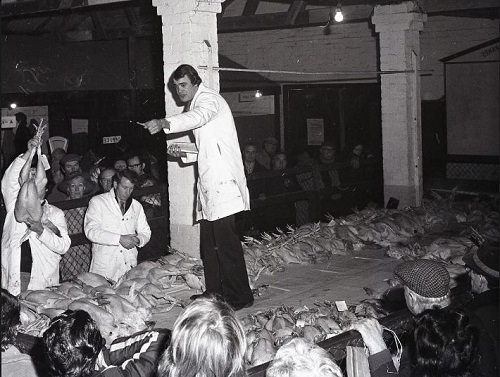 Like Sodbury, there were cattle, sheep and also hens on display at Yate market, and regular fat stock shows took place alongside. Transporting animals changed markedly over the years. Rail was common for transporting animals distances and many farmers came by car and trailer, even with sheep in their car boots on some occasions. The traditional way for local farmers was to come to market by pony and trap, and have skilled drovers lead around 50 sheep or cattle along our local country roads. The market in its heyday was a real social occasion for farmers and their associates. It was also a great opportunity for local businesses to benefit. The lamented Railway hotel was the market pub par excellence. At the end of the 19th and early 20th centuries the pub would provide a market lunch for local traders, reflecting the value of market trade to the pub. Now until March 14: Down the Market – The Markets and Fairs of Yate and Sodbury. Charting the long history of markets and fairs in the area with evocative artefacts from the time.